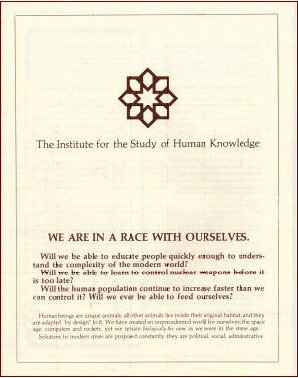 A brochure entitled "We Are in a Race With Ourselves" in the 1970s laid out some of the problems and issues facing the world today. Are the solutions to these problem issues within our grasp, or are we still in a race with ourselves? Human beings are unique animals: all other animals live inside their original habitat, and they are adapted "by design" to it. We have created an unprecedented world for ourselves: the space age, computers and rockets, yet we remain biologically the same as we were in the stone age. Solutions to modern crises are proposed constantly; they are political, social, administrative. They are each useful, but only to a point. There can be no complete solution or anything close to it, until enough people understand that most of the diverse problems facing us are of our own making and are so because of a lack of understanding of who we are, how we react, and what we might be able to accomplish, and to become. Therefore, an important part of the uniqueness of being human is that we must continually adapt to our own creations. The most important thing we inherit is the ability to go beyond our inheritance. The past few decades have witnessed on the one hand, a population explosion, but on the other, an explosion of new information about human nature: where we came from and why, how we develop, what we might become. There has been such a ferment in this area that this new and extraordinary "Human Knowledge" is still scattered: in different departments of different academic disciplines all over the world, in biological studies of molecular evolution, in neuroscience and cognitive science, in the writings of novelists and works of artists, in the experiences of journalists, filmmakers, and politicians. What is urgently needed, and now, is to assemble these pieces of the puzzle into a comprehensive picture of human nature and to apply this conception to current life. For this we need a multi-university, multi-disciplinary and multi-cultural approach. This is what The Institute for the Study of Human Knowledge does--it works with educators, brain scientists, biologists, ecologists, physicians, sociologists, novelists and others to communicate and coordinate new insights, faster than would otherwise be possible. It tries to broaden the base of information available to our society: to our decision-makers, to our scientists...to our students. Solutions to the significant problems facing modern society demand a widespread, qualitative improvement in thinking and understanding. We are slowly and painfully becoming aware that contemporary challenges such as the use of energy, the unchecked increases in population, problems of environment, employment, the health and psychological well-being of individuals and the meaningful education of our youth are not being met by the mere accumulation of more data or the expenditure of more time, energy, or money. In view of the increasing pressures imposed on our society by these problems, many responsible thinkers have realized that we cannot sit back and hope for some technological invention to cure our social ills. We need a breakthrough in the quality of thinking employed by both decision-makers at all levels of society and by each of us in our daily affairs. There is a re-awakening of a concern with the mind within psychology: how it develops in the infant; how it can be educated; its capabilities in adulthood. This concern has revolutionized psychology: cognition and consciousness are part of the course of study of many students. The Institute has encouraged this trend and may be in part responsible for it: its publications and symposia on consciousness, mind and brain, have stimulated researchers and teachers in this new field. Now, there is a new recognition: many of the boldest insights of modern psychology--the stages of mental development, the errors we are prone to make--have been described in writings published about 1,000 years ago! The Institute is mounting a new program to discover and publish such anticipations of modern thought, because new insights on human development and capabilities may be available. Our education, science, and medicine do not deal with the whole mind and person--the full range of our capacities. Observations such as this have often been made in the past, yet we are rarely informed: which of our capacities lie undeveloped? Are they useless or meaningful? What might be the methods for educating the whole mind? What might such increased mental ability mean, for individuals, for our society, and even for the future of civilization? Some of this information is available in contemporary research, some in the past, but it needs to be brought together. When we attempt to educate our students, we are limited by the "lowest common denominator" concept of our mind and our capacities--"Reading, Writing and Arithmetic." The varieties of human intelligence are scarcely to be recognized in the standard range of "intelligence" tests. What has been considered "basic" in our schooling is but a small segment of our capacity. We, our student, patients, and colleagues are not being prepared to understand the complex nature of the world we live in. Thus, the "environmental" problems, those of overpopulation, are related to the lack of an education of our ability to perceive things whole, to develop a comprehensive intelligence. We are "designed" to analyze things only as they relate to ourselves. This analytic, sequential capacity is only one aspect of the mind. We also have the ability to consider whole systems simultaneously and perceive each element as it affects the others. This ability to "see things whole," to comprehend relationships between parts, to understand personally such concepts as "the welfare of all" can itself be trained as part of a more comprehensive education. There is a saying in Greek philosophy, "You cannot step into the same river twice." We would propose a change to, "You cannot step into the same river once," for entering alters the flow, level, and perhaps temperature immediately. We must be able to perceive the effects of our actions in the world, immediately, perhaps "intuitively," for both our ability to intervene and our numbers exist on a scale unprecedented in human history. There are billions of people now in a world that, not too long ago, held a few millions. It is this rise in our numbers, coupled with the increased ability to manipulate the environment, that makes our situation so dangerous. The hand that was designed to hold a few spears now controls thousands of nuclear weapons. So, what many people often consider purely "environmental" problems--the smog over many of the world's cities, the chemical pollution of the waters of industrial nations, the over-crowding and increasing growth of population--are problems of human choices and understanding. Since we are training to focus on splintered pieces of a whole situation, we have often take quite inappropriate actions: the increased safety and security of reproduction in the most recent 100 years has suddenly made large families unnecessary, yet we have been too slow to perceive this, and the explosive exponential growth of human population has been the result. Our increasingly brilliant analyses of the relation of mass to energy has brought with it the possibility of nuclear holocaust. On these important matters, human understanding and judgment has not developed to balance and evaluate the technical progress. We are in a race with ourselves. There is a new understanding the Health Sciences that the brain is a healthcare "system" in each person. The brain regulates every movement, every heartbeat, every gland's secretion and millions more microevents. All of them are to the purpose of keeping the organism healthy, some of which have only recently been discovered, such as the endorphin system. Many of the mysteries of how social and emotional events influence health are found in the complex brain mechanisms which interpret the outside world, and direct the body to take appropriate action. Grief can affect he immune system; increased social support can influence health (friends can be good medicine); mental attitudes strongly affect health: those who think they are healthier live longer than the "objective record" would have it. This new understanding will, in the next decade, radically influence our idea of health and healing. It is founded on recent developments in brain sciences and increased cooperation between brain scientists, physicians, psychologists and sociologists. The Institute invited you to help in developing this new and comprehensive understanding about being human: where we come from, what we might, in our own lives, become. The Institute supports the publication of books, public lectures and public information which will contribute to a permanent improvement in human abilities and comprehension. Your help is needed for its programs of research and communication in medicine, education, psychology and human ecology. In the end, we have to rely on our own resources as human beings. For the first time we may be able to know what they are.